Kelly did a fantastic job of moderating and immersing us in a forgotten garden fairy tale. A couple of games were played to start out the night and to hand out fantasticly themed prizes. One game was to name the 7 possible Fairytales written by Eliza Makepeace, and the other was to list the 9 items Cassandra found in Nells' little white suitcase. 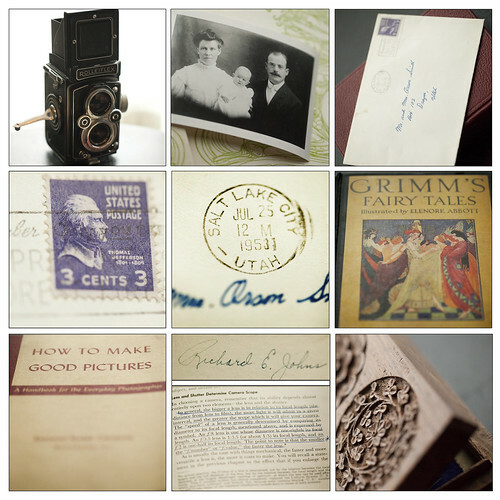 Those 9 objets were: a silver brush, an old fashioned white dress, bundle of papers tied with a blue ribbon, black and white sketch of a woman under a stone arch, envelopes, notebook full of paper (Nell's journal), brochures (from travels), an old photograph, Book of Magical tales for boys and girls. We then discussed how each of these items, as well as other objects mentioned, held stories about the people whose lives they touched, stories that were revealed only piece by piece in the book. Makes you think what items have been handed down to you that tell a story of a relative in the past? (see a few of mine at the bottom of this post) and then... what items will you pass on to tell your story? Overall rating for this book was about a 4.5 stars, although some more than others in the group shared how impressed they were with the complex yet natural writing style and the amazing amount of suspense built as the mysteries of Nell's and then Eliza's pasts were slowly unfurled. There is no doubt how difficult it would be to write a story that: incorporates 3 generations, gives details gradually, forms connections between different characters in different eras, contains foreshadowing, doesn't have all the windows to the past appear in chronological order, adds in the magic of fairy tales, tells about antiques and the nostalgia they evoke, keeps a reader interested and not overwhelmed, all at the same time. But Kate Morton, author of the The Forgotten Garden, achieved all of these things beautifully. 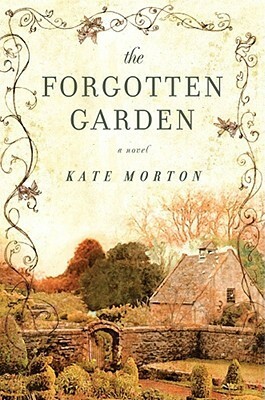 A few writing devices and themes that Morton used to accomplish this depth in the novel are: Secrets formed through the strict and rigid conventions of society mixed with festering jealousy and repressed feelings, secrets kept and then hidden because of characters getting stuck in and holding onto the the past, and then foreshadowing through the use of symbolism in the fairytales. Although it might take you reading through half of the novel before you discover it, you will find that the mystery is created in the life and trials of Eliza Makepeace back in the late 1800's. And the mystery is maintained throughout most of the book because of the social conventions of the time in which the mystery was formed. After going through a traumatic childhood Eliza makes a choice that will change her life forever, to bare her cousin and cousin's husband a child. Social conventions and stereotypes of the time helped lead to this complicated decision. Rose, Eliza's cousin, was stressed to the degree of obsession by her need to fulfill her role in society of becoming a mother and providing her husband with posterity. Rose eventually found that this was role she physically couldn't provide for herself which then leads her to Eliza as a possibility to obtain the unobtainable. Years of abuse, hidden behind facades of perfection, left Eliza with deep emotional scars which she tries to heal when she agrees to Rose and Adeline's pleas to conceive and bear a child, but to her misfortune breeds jealousy along with the deed. Lies, mistreatment, and then the eventual death of Eliza followed, all as means of covering up the truth in attempts to keep up appearances. The secrets of parentage, affairs, and love had many chances to come to the surface and be known earlier, but because a few of the characters couldn't move on from the past and look forward, secrets already bred got hidden even deeper and then forgotten. First chance was: what if Eliza could have left the mourning broach instead of going back for it? Then Nell as well as Nell's posterity would have known Eliza was Nell's mother, resulting in a happy ending earlier instead of a mystery prolonged. Second chance was: What if Nell didnt turn away and close up from friends and family when she learned she was adopted? Her relationship with Cassandra's mother could have been more loving and honest. If Nell didnt define herself by the sins of her fathers she then could have had a more happy family life herself as well as share and not be ashamed of the past, as she found it out, with her posterity. But the Mystery was sustained, waiting for us readers and Cassandra to sift through the clues and eventually find the answers. Lastly, the fairytales, while adding mystic and magical elements to the story by tying the many generations together, they also acted as foreshadowing for the characters and makes the completion of the book more rewarding for us readers. For example: "The Crones Eyes". After reading the book you can see the parallels of the characters in the tale with the characters of Nell and Cassandra. The Crone being Nell who got her eyes or "the truth/ her past/ her dreams" taken and hidden from her until a time she would be courageous enough to seek them out, but when that time came so did a princess or Cassandra who would cause Nell to give up her mission. Cassandra would then have to travel through the land of lost things, or a grieving period after Nell's death to find what Nell had hoped to find herself. Hope and purpose being a couple things that both Cassandra and Nell are connected by as both had lost them during many moments during the story. Then, finally deep in a well or possibly... in a secret garden, the truth is found. The discovery not happening in time to save Nell but just in time to save Cassandra. The truth restoring Cassandra's hope for a brighter future with her Prince, Christen. Objects that connect me to my past: (from top to bottom, left to right) My father's father's camera, a photo of my mother's grandparents and my mothers aunt as a baby, a letter to my grandmothers parents found in a book I inherited from her, postage was 3 cents!, post marked 1953, my grandmothers book of fairy tales she gave me (love the art nouveau illustrations), my grandfathers book on photography, he wrote his name in the cover and I loved seeing what he underlined and thought interesting, my grandmother's box she bought in Japan which is a place I have grown to love since Reece served his mission there and I photographed my BFA graduating show there).